ATLANTA—In 2014, the Obama administration allowed Federal Bureau of Prisons inmates to submit applications for clemency—or the commutation of sentences thousands of mostly Black, first time, nonviolent offenders, suffered under mandatory sentencing of 100 to 1 for crack cocaine versus powder cocaine convictions in the 1990s. The “war” meant that for every conviction involving crack cocaine, there would be longer sentences for men and women who had never been convicted of a crime. Sentencing resulted in Black men and women often serving as much prison time if not more than their White and violent counterparts. Steffany “Stet” Frazier, 48, is such a man. In 1994, he was convicted of possession of crack cocaine with the intent to sell. He has served 23 years of a life sentence, under the 100-1 penalty. The Fair Sentencing Act of 2010 was signed into federal law by President Obama. It reduced the disparity between the amount of crack cocaine and powder cocaine needed to trigger certain federal criminal penalties. The disparity in sentencing fell from 100:1 to 18:1. The act also eliminated a five-year mandatory minimum for simple possession of crack cocaine. But the law is not retroactive and does not affect those incarcerated since the early 1990s. Mr. Frazier filed for clemency and was denied in January of last year. Now he is petitioning Congress on behalf of inmates in 70 federal institutions. He wants the 2010 law to be made retroactive, in hopes of commuting thousands of sentences. “January 30 those of us under the crack cocaine disparity are petitioning Congress. The reason is because every branch of the United States government has said that the crack cocaine disparity targeted one race of people,” Mr. Frazier told The Final Call. An online petition has been created by the organization 100 to 1 Disparity to be presented to Congress. Though an appeal can only come through the injured parties, those convicted, the petition is designed to raise public awareness. It is available at https://www.change.org/p/united-states-congress-eliminate-the-100-to-1-crack-cocaine-disparity. There is another stipulation, he contends, that leaves the ultimate commutation of a sentence up to federal judges and prosecutors, which Mr. Frazier argues is not a part of Fair Sentencing criteria. With no evidence to support the notion, crack cocaine was billed as more addictive, more dangerous than powder cocaine and the cause of more violence and gun use than powder cocaine, he said. A Black man named “Bias,” said the prison reform minister. “Bias is defined as a prejudice in favor or against one thing, person, or group; usually in a way considered unfair,” he said. A role model and stellar inmate, Mr. Frazier, a Muslim practicing the teachings of the Most Honorable Elijah Muhammad under the leadership of Minister Louis Farrakhan, has been lauded for his work while behind bars. He has worked with fellow inmates since the 1995 Million Man March. 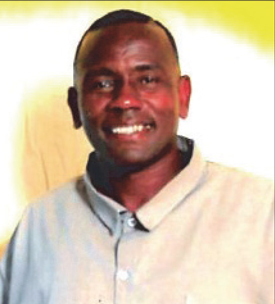 Whether his clemency is granted or not, he wants to be a voice for the voiceless. “When I was denied clemency, January 6, 2016, I went to paying more attention to these clemency denials (of others). When the president granted clemency on Aug. 3, 2016, only 51 individuals were of the 1990s. May 5, 2016, only 21 were of the 1990s. May 30, 2016 only 16 were of the 1990s and October 6, 2016 only seven were of the 1990s. They are excluding us,” he said. Mr. Frazier was denied clemency by the Obama Administration in January, 2016 and January 2017. In his 2016 denial letter, Mr. Frazier throughout the letter was identified erroneously as a female. “I stand for Keith Ward, Oscar Lee Brown, Robert Moss, Jr., LaTonya Davis, Yolanda Dean, Paulette Morris, Lester Johnson, Willie Norton … I can go on and on. These are those who have been denied clemency and are lifers,” said Mr. Frazier. “We didn’t ask to submit a clemency,” recalled Mr. Frazier. 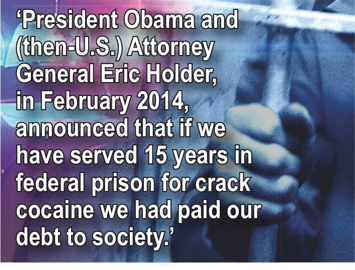 “President Obama and (then-U.S.) Attorney General Eric Holder, in February 2014, announced that if we have served 15 years in federal prison for crack cocaine we had paid our debt to society. So throughout the Bureau of Prisons they held town hall meetings soliciting us to put these applications in. Once I was denied clemency, January 6, 2016, it really, shocked the whole institution, including staff members, because they know with my record and the things that I have been doing throughout the system, they know that if anybody could have got it (clemency) it was supposed to be me,” Mr. Frazier said. Mr. Hayward, a Florida attorney, is also Mr. Frazier’s first-cousin. Both hail from the rural southwest Georgia town of Camilla. They grew up together. Before 2013, the lawyer had not seen his cousin since his 1994 conviction. “As I spoke more with Stet on a daily basis, I learned that there are thousands of people serving life sentences for crack cocaine. I knew that we had to do more and get more people involved,” Mr. Hayward said.